In an SPA, you need to consider the price of the object, in which currency the price will be paid and the payment terms of the price. In the international goods trade, incoterms are widely used to specify the price components, rights and obligations of both parties. 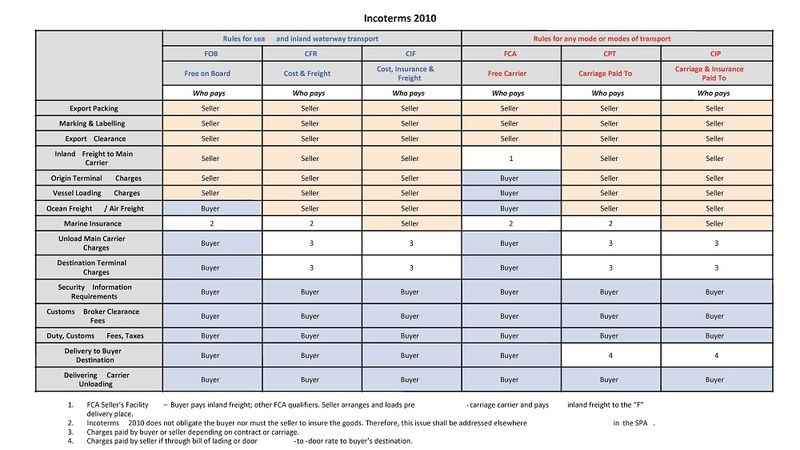 The table on the next page shows the price components, rights and obligations of the six most used terms under incoterms 2010. Among these terms, FOB, CFR and CIF are used only for sea and inland waterway transport, and FCA, CPT and CIP can be used for any mode or modes of transport. From this table, we can find that, under the FOB and FCA, the buyer is obliged to sign the transportation agreement. Usually the buyer will also nominate its export forwarder. Therefore, these two terms are usually more beneficial to the buyer. Also, except for the terms of CIF and CIP, incoterms 2010 does not provide which party is obliged to insure the goods. Therefore, it is recommended that the parties make this obligation clear in the SPA. -The remaining 10% of the transaction price will be paid upon delivery of the last batch of goods or upon the date of expiry of the quality warranty period. Payment by installments could effectively lower the risk for the buyer and also relieve the seller's financial pressure at the same time. In the SPA, the parties will address the currency to pay the transaction price. Due to exchange rate fluctuations, both parties might suffer from exchange losses. Therefore, when choosing the currency for payment, you need to make judgments on the exchange rate trend and select the currency that is beneficial, or whose exchange rate is relatively stable. Also, you could request to stipulate in the SPA provision of sharing the exchange loss by both parties. For transactions of large scales, you could also request to stipulate in the SPA that the transaction price will be adjusted according to the fluctuation of the exchange rate. To guarantee the quality of the goods, it is recommended that you pay attention to the following issues. The seller shall make clear any labeling on the transport package of the goods, which usually includes shipping marks, indicative marks, warning marks, etc. The shipping marks, as you can see in the first picture, usually contain the basic information of the SPA and shipping documents, such as the short name or code for destination, consignor and consignee, the volume, weight and production country or area of the goods, etc. The indicative marks, as you can see in the second picture, usually address the specific feature of the goods, such as fragile or need to avoid dampness. The warning marks, as you may also find in the third picture, are fixed on dangerous goods. In accordance with the PRC Regulations on Certification and Accreditation ("Certification Regulations"), the PRC General Administration of Quality Supervision, Inspection and Quarantine and the PRC Certification and Accreditation Administration jointly released a list of products subject to CCC ("Certification List") in 2001. In accordance with the Certification Regulations, none of the products in the Certification List could leave the factory, be sold, imported or used in other operation activities before they are certificated by the certification institutions designated by the PRC Certification and Accreditation Administration and labeled with the certification mark. The Certification List covers a wide range of categories of products, such as household compliances, automobiles, safety glass, electric wire and cable, toys, etc. For products which pass the CCC, this label will then be affixed thereon. Therefore, if the transaction goods are on the Certification List, it would be better to include the clause that CCC labels should be affixed on the transaction goods. In accordance with the PRC Law, import and export inspection is compulsory for certain goods, such as radios, TV sets, dangerous goods and perishable goods. And the HS Codes adopted by the PRC Customs corresponding to the goods could be used to check whether the goods are subject to compulsory export inspection. If the goods you purchased are subject to such inspection, you may state in the SPA which party shall be responsible to bear the cost of the export inspection required by the PRC Law, for example, the export inspection shall be duly handled by the Chinese seller on its own cost. 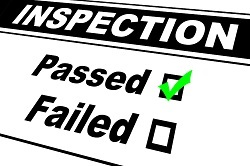 In spite of the compulsory inspection, the parties may also reach an agreement on the non-compulsory import and/or export inspection by themselves. The parties may agree on the term, place, standard, method and fee bearing of the inspection. Regarding the terms of inspection, in accordance with PRC Laws, if the parties do not agree thereon, the buyer shall inform the seller of the defective goods within reasonable time or within two years since the date when the goods have been received, depending on which is shorter. Or, if there is a warranty period to the quality of the goods, such a period rather than the two-year period shall be adopted. However, if the seller knows or ought to know the goods delivered are defective, the buyer will not suffer from the time restriction stated previously. As we have just mentioned, if the parties do not agree on the inspection period, the PRC law provides a maximum two-year period for the inspection. However, as a buyer you could request to state a longer warranty period in the SPA. Also, you could require the Chinese supplier to buy product liability insurance for the goods sold. In case any dispute regarding product liability arises, in accordance with the PRC laws, if the infringer conducts operational activities in the place of habitual residence of the infringed party, the laws of the place of habitual residence of the infringed party could be adopted, which might mean the parties face larger compensation liability if said jurisdiction is more in favor to the infringed party. 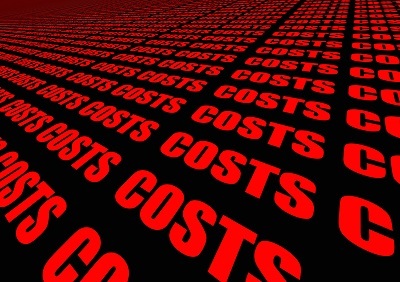 In such cases, the parties shall carefully negotiate and agree on the product liability and buy sufficient product liability insurance to cover the potential risk. In the next part, we are going to address on the (i) confidentiality clauses; (ii) exclusivity obligations; and (iii) governing laws and dispute resolutions to be stipulated in the SPA.